A quick announcement on behalf of Dundalk County Museum about a very interesting looking Viking conference (and exhibition), which is taking place in October. The conference has an excellent line up of speakers and should be very informative. Following the discovery of the Viking site in Annagassan last year, the County Museum, Dundalk has announced details of a major exhibition entitled Raiders, Traders and Innovators – The Vikings and County Louth. 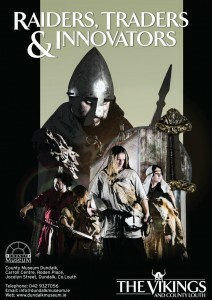 The exhibition will examine the impact that the Vikings had in the county, will open on Friday October 21st running to February 2012. Featuring objects from the National Museum and the County Museum’s own collection the exhibition will highlight the nature and extent of Viking activity under a variety of different topics during their period in the county. It will also feature the story behind the discovery and ultimate identification of the Linn Duachaill site in Annagassan. Coinciding with the exhibition a conference highlighting the nature of Viking longphorts will be held the weekend of October 22nd and 23rd at the Town Hall Theatre. With speakers from Ireland and Britain the conference will highlight the importance of the discovery of the Linn Duachaill site at Annagassan, making comparisons with other sites located throughout the country, as well as several sites in Britain. Amongst those scheduled to contribute include Dr. Donnchadh Ó Corráin (UCC); Dr. Eamonn Kelly ; Dr. Howard Clark, Dr. Cathy Swift (University of Limerick), Dr. John Sheehan (UCC), Dr. Mark Clinton, Dr. Gareth Williams (British Museum) and Linzi Simpson. The weekend will also feature a guided tour of the Annagassan site. A conference fee of €45 will be charged, this includes conference lunch and banquet at the Crown Plaza (an alternative price of €20 will be charged for those who do not wish to attend the banquet). More information about the conference may be had by contacting Brian Walsh at 042 9327056. Sounds fascinating. There’s a possibility that members of the Celtic Society NUI Maynooth would like to attend the conference. Could you please advise regarding cheap accommodation close to the venue. Please reply to my e-mail address and visit our FB page: Celtic Society NUIM. Many thanks.